A suspected kidnapper who attempted to abduct four school children at T.T.C Road, Ikot Ansa area of Calabar in Cross River state, has met his waterloo in bizarre style. 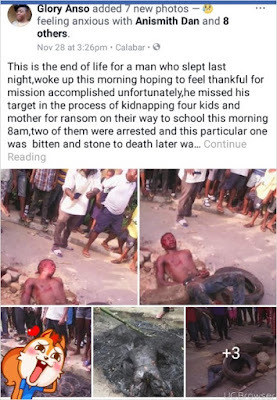 A Facebook user identified as Glory Anso has taken to the social networking platform to share some shocking photos of a suspected kidnapper who was caught while attempting to abduct four school girls and their mother and was lynched to death by angry mob in Calabar, the Cross River State capital on Wednesday. Glory shared the photos and wrote; ‘This is the end of life for a man who slept last night,woke up this morning hoping to feel thankful for mission accomplished unfortunately,he missed his target in the process of kidnapping four kids and mother for ransom on their way to school this morning 8am.